Why is Georgia’s New Hands-free Cell Phone Law Causing Controversy? Beginning on July 1, 2018, the state of Georgia enacted a new law designed to lower the devastating effects of distracted driving in the Peach State. Signed by former Governor Nathan Deal, House Bill 673, the Hands-Free Georgia Act, requires drivers to use hands-free technology in order to use their cell phone or smartphone while behind the wheel. The new law states that holding a cell phone or electronic device in your hand while driving is against law. Period. This means talking, testing, taking a picture, watching or recording a video and any other activity where you’re holding a mobile device is now illegal in the state of Georgia. ‘Wireless telecommunications device’ means a cellular telephone, a portable telephone, a text-messaging device, a personal digital assistant, a stand-alone computer, a global positioning system receiver, or substantially similar portable wireless device that is used to initiate or receive communication, information, or data. Such term shall not include a radio, citizens band radio, citizens band radio hybrid, commercial two-way radio communication device or its functional equivalent, subscription based emergency communication device, prescribed medical device, amateur or ham radio device, or in-vehicle security, navigation, or remote diagnostics system. For instance, Georgia drivers are still allowed to use a cell phone so long as it’s done using hands-free technology. Using a GPS system or app is also acceptable. Holding a cell phone is also legal if you need to report an accident or there’s another emergency while you’re driving. This law doesn’t apply individuals who are performing professional duties like police officers or other emergency personnel. It does, however, apply to school bus drivers. This isn’t the first time the state of Georgia has taken steps to stop distracted driving with cell phones. In 2010, texting while driving became a criminal offense; however, law enforcement believed the law to be difficult to enforce, and traffic fatalities in the state have increased over the past few years. This new law has some Georgia residents concerned. With a fine of up to $150 for multiple offenses, some citizens think that being unable to touch their device is taking the law too far. Whether or not the new legislation will help decrease the number of fatal accidents in Georgia remains to be seen. Just be sure you’re not got red-handed holding your cell phone behind the wheel! This wide sweeping law doesn’t just impact citizens, but also employers. Companies should amend their employee handbooks and safety policies to inform their employees — particularly those whose duties involve driving — about this new law and its implications. Workers, too, should note this new law and tell their employer about it if they aren’t aware. If you or a loved one have been seriously injured on the job, or suffered an occupational injury, you should know that you have legal rights under the Georgia workers’ compensation law. 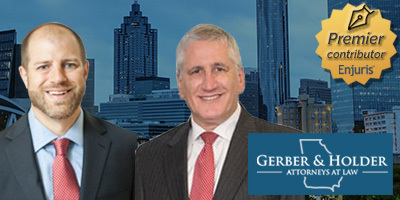 At Geber & Holder Law, our Atlanta attorneys can tell you what those rights are and we’ll fight aggressively on your behalf to negotiate a fair settlement—and even take your case to the highest court in the land if necessary. We see every client as an individual with a unique story and important concerns. Our law firm has served our clients faithfully in every case. By doing so, we have been able to build a history of success stories by securing large workers’ compensation settlements and payouts. Most importantly, we’ve been able to change the lives of our clients, helping them recover physically, emotionally and financially. View our profile and visit our website today. What do you think about Georgia’s new hands-free law? Atlanta, GA Workers' Compensation Attorneys Award-winning attorneys, dedicated and driven.